With The Marcothon, comes challenging weather. Guaranteed. I think it's more to do with it being December, rather than something personal though. Although this year I was prepared with Kahtoolas and Yaktraks at the ready. I've been asked a few times by non-gripper-owning runners which of the two I would recommend, so I thought I'd post my verdict. What they say: The Yaktrax Pro is ideal for the person needing increased durability while working, running or enjoying outdoor activities on ice or packed snow during the winter months. 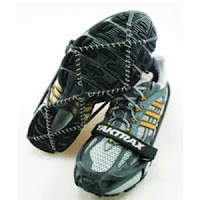 It is equipped with a removable performance strap that was designed for stability. Yaktrax Pro are made from natural rubber with 1.4mm high- strength abrasion resistant coils made from 70% recycled metal. Easily transportable: You can roll them up and stick them in your pocket, belt or simply carry them. Fairly inexpensive and can be purchased from as low as £10 online - depending on demand. Great for walking too, so can double up for everyday use during icy conditions. They are quite tricky to put on - especially when balancing on one leg using cold hands. I've heard quite a few reports of Yaktraks breaking/snapping. I've also heard quite a few reports about them slipping or falling off - hasn't happened to me though. Off-road, they are OK, but not great. You still have more confidence, you need to keep your wits. Plus, the coils can become chocked with grass and mud - which makes them less efficient. What they say: Just think – a pocket-sized ice traction system that makes any terrain, any time of year, possible. Kahtoola MICROspikes® Traction System aren’t just spikes that dig in – they’re your passport to anywhere adventure takes you. 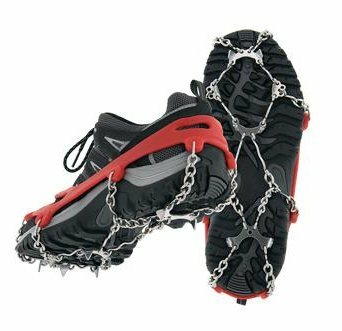 When you don’t need a full-on crampon the MICROspikes® Traction System will get you where you need to go with ease and precision. The slip-on lets you travel safely and quickly across ice, scree, snow-covered driveways, wet rocks and anywhere else you just need a little more traction. I feel 100% confident wearing Kahtoolas - even running downhill on ice. You can run. Like properly run. No slippling or worrying about slipping. Off-road, they are far superior than Yaktraks. They slip on with ease. And stay on, very securely. I've only heard good reports about Kahtoolas - and no products faults. They made running on thick ice an absolute joy - honest! They are a bit too aggressive for pavements or thin ice. I liken it to running in a down jacket, when all your need is a long sleeve tee. They perform better on harsher ground. You need a back pack to transport them on a run. You could stick them in jacket pockets, but you'll be rattling about like the ghost of Christmas past! They're not exactly cheap, retailing at around £45-£50. In summary: I would use (and recommend) both. They are well worth the investment. You can't put a price on safety and staying injury free - and off the treadmill! If you can only choose one or the other, then it's best decide on where you will do most of your winter running. Hi, I had a pair but trashed them on sharp trails with limited snow cover. Good but need some decent cover to protect rubber at connections.